(Bloomberg) -- Senior officials from North Korea and the U.S. are reported to be in Stockholm for talks ahead of a possible second summit between Korean leader Kim Jong Un and President Donald Trump. According to Sweden’s Dagens Nyheter newspaper, North Korean Deputy Foreign Minister Choe Son Hui and Stephen Biegun, the U.S. special envoy to North Korea, have arrived in the Swedish capital. The paper didn’t give a source for the information. Swedish Foreign Ministry spokesman Erik Karlsson told Bloomberg that Choe Son Hui had arrived in Sweden. The meeting would be their first since Biegun’s appointment in August. Dagens Nyheter said Foreign Minister Margot Wallstrom is representing Sweden at the meetings, which are taking place at an undisclosed location in the Stockholm area. 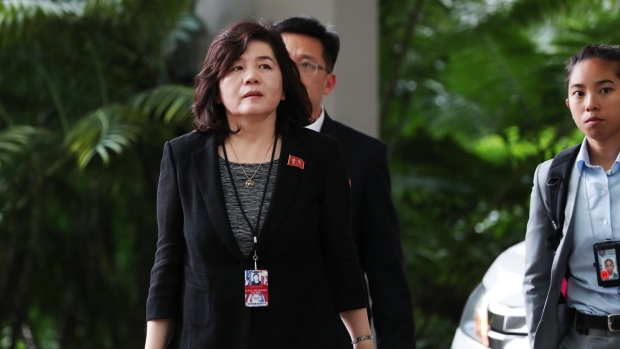 The talks come as a top aide to Kim Jong Un prepares to meet Trump and Secretary of State Michael Pompeo in Washington. The flurry of diplomatic activity signals that a second face-to-face meeting between the two leaders could take place soon.